This article is 419 days old. 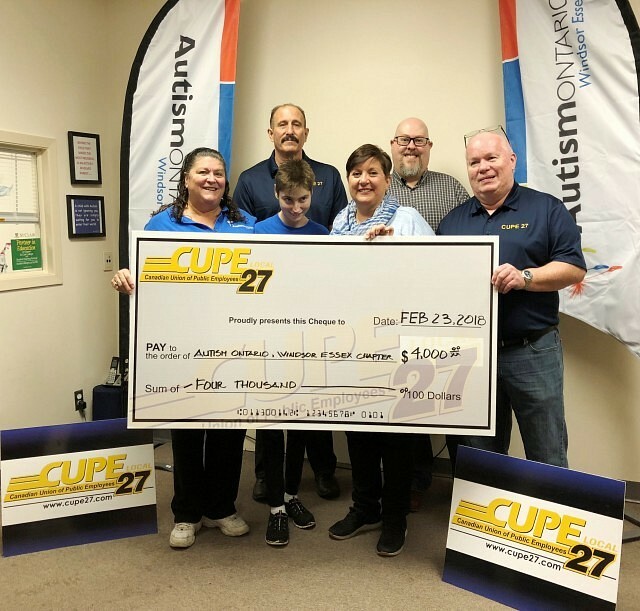 The Windsor Essex chapter of Autism Ontario received a donation of $4,000 from CUPE Local 27 to support the programs and services offered to children and adults coping with Autism. “Autism Ontario Windsor Essex would like to extend our deepest gratitude to CUPE Local 27 for this generous donation. All our funds stay local in our chapter to help our children and adults coping with Autism through programs and social learning opportunities including summer funding to help families as well as providing our summer picnic and Christmas parties for our families. We could not run this level of programming without CUPE Local 27’s amazing contribution. As a mom of a child with Autism, I thank you from the bottom of my heart,” says Julie Bondy, Chapter Vice President. CUPE Local 27 represents custodians, building maintenance, preventative maintenance, courier drivers, locksmiths, and a window glazier employed with the Greater Essex County District School Board. “CUPE Local 27 recognizes how important it is to give back to those who need it most in our community,” says Fred Jamieson, President of CUPE Local 27. “The Windsor Essex chapter of Autism Ontario provides critical programs, supports and recreational activities for children and adults coping with Autism. CUPE Local 27 is proud to assist them with their important work,” adds Jamieson.